Here are all of the photos from the Anderson side of my family. Single click onto an image to see it at full-size. Home of my great great great grandfather, Robert Snr. Anderson, and his family in the early 1800s. Photo taken by Sue Broadway, his great great great granddaughter, in August 2010. 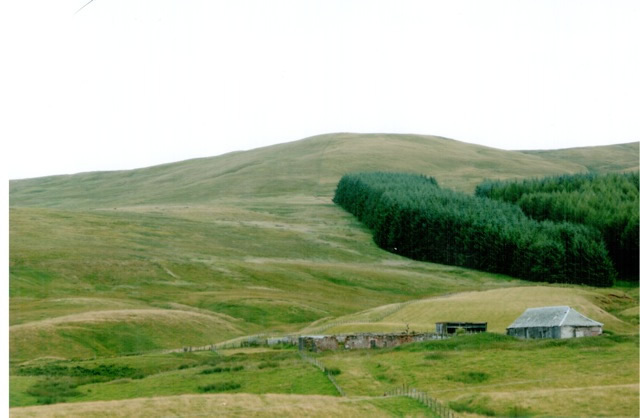 The farm was occupied by a family of shepherds, the McKechnies, until about 1950 when the building was left to fall into disrepair. Situated in North Merchiston Cemetery, Edinburgh. Photo taken by Sue Broadway in August 2010. The gravestone of my great great grandmother, Jane Veitch Anderson (husband of Peter Anderson), her daughter and son-in-law, with a memorial to her grandson killed in WW1, lies face up, detached from its base, in North Merchiston Cemetery, Edinburgh. The inscription on the headstone reads: "in memory of Robert A Morgan Cameron Hrs (Lochiel) died of wounds received at Kemmel Hill and interred at Deinze, Germany 10 May 1918 aged 22 The beloved son of Joseph and Janet Morgan also the above Joseph R Morgan died 4 January 1933 aged 75 and his beloved wife Janet Anderson died 22 February 1940 aged 79 Jane Veitch Anderson 16 March 1893 aged 68". The base is inscribed "He died that we might live". Jane Veitch Anderson was interred in the plot on 16 March 1893 and it appears the headstone was subsequently erected. It is understood that Robert A Morgan was subsequently re-interred at the Harlebeke New British Cemetery in Belgium after WW1 ended. Photo taken by Sue Broadway in August 2010. Gravestone restoration in January 2011 paid for by Sue Broadway and Bob Anderson. Photo taken by Bob Anderson on 12 February 2011. The home of my great great great grandfather, James Veitch (father of Jane Veitch), in the 1840s. 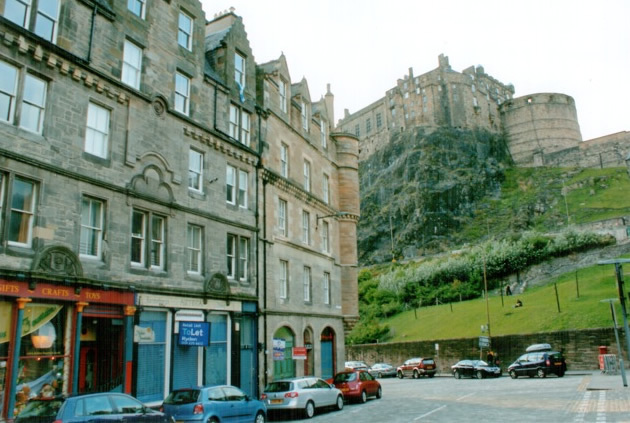 Situated below Edinburgh Castle (pictured). The doorway to the house is between the blue and silver cars. Photo taken by Sue Broadway in August 2010. My great grandparents and their 13 children taken in London in the early 1900s. Robert Jnr. was a journeyman cabinet-maker and I am the proud owner of a maple chair made by him. Back Row: Charles Edward (1887-1921); Ernest Robert (1881-1930); Janet (1886-1922); James Henry (1882-1919); Helen (1879-1960); Alfred (1884-1954); Peter Frederick (1880-1943); Alice (1891-1924); William Walter (1890-1931). Middle Row: Arthur Harold (1892-1975); Daisy (1894-1962); Robert Jnr. (1849-1920); Martha (1852-1927). Front Row: Margaret Eliza (1895-1979); Beatrice Lily (1897-1966). Robert Jnr. worked at Waddesdon during its construction for Baron Ferdinand de Rothschild between 1874 and 1889. Robert Jnr. reputedly built this staircase and its mirror image. They lead to the servants quarters. Birthplace of my great grandmother, Martha Williams (1852--1927).Top Left: 1880s-Drawing of White Lion sign. Closed as inn in 1892; Top Right: Post 1892-Former White Lion in right foreground. Now shop of F W Robinson, coachbuilder; Bottom three photos: Early 1960s-2/3 of building now demolished. Remnant used as storeroom until demolished in early 1990s to make way for inner ring road. 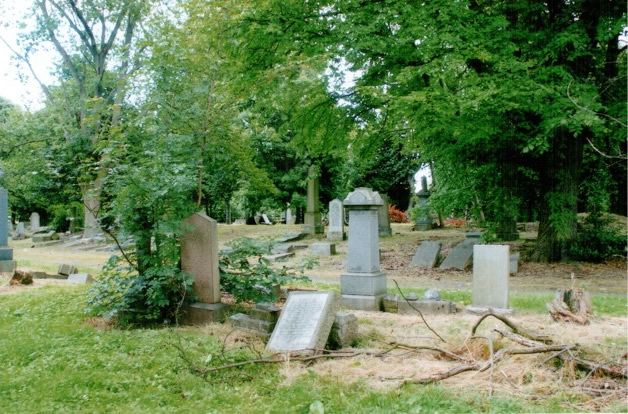 The graves of my great grandfather and his children Charles Edward, Janet (Sweet) and Alice Maud in Kensal Green Cemetery, London. The inscription below Robert's details reads: "A light is from the household gone, a voice we loved is stilled, a place is vacant in our home, which never can be filled"
The same graves with the cross re-fixed in January 2014. Home of Robert Jnr. Anderson. He and his family lived there from before 1911 until his death there in 1920. 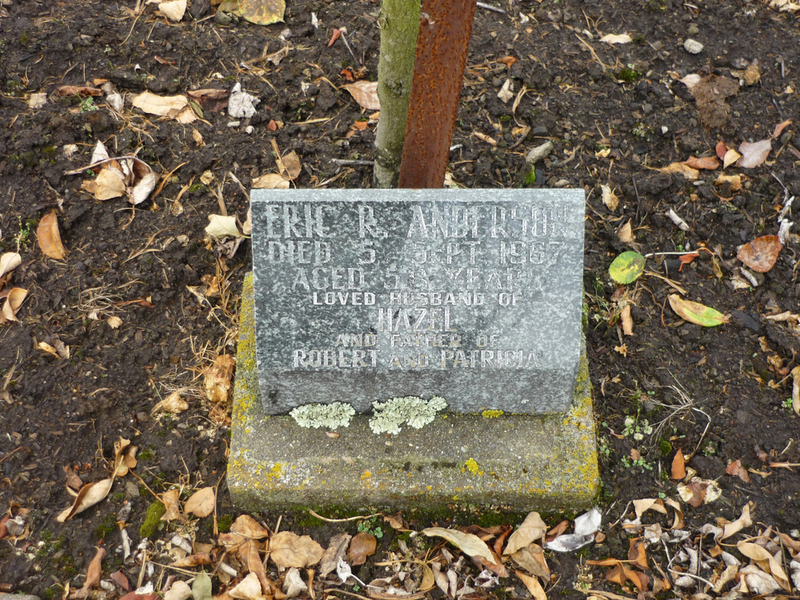 Grave of my great grandmother in Aramoho cemetery, Wanganui, New Zealand. Martha, Robert Jnr. 's widow, died on 17 April 1927, the year after she sailed to New Zealand with her daughter, Margaret Eliza Anderson. 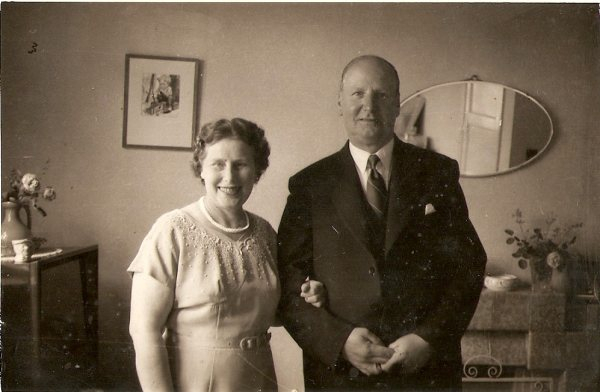 Photo of my great uncle with his second wife, Violet. Photo and card sent by Charles Edward Anderson to his parents, presumably while he was in North America. These items were provided by Patricia Fuller, the granddaughter of Charles Edward. Photo of my great uncle and his wife Laura (nee Honey) with one of their three children. Charles Edward and Laura both died in 1921, leaving their children to be brought up in orphanages. Montage of Leslie William, the son of Charles Edward and Laura Anderson, who was brought up in orphanages and served in the royal navy during WW2. 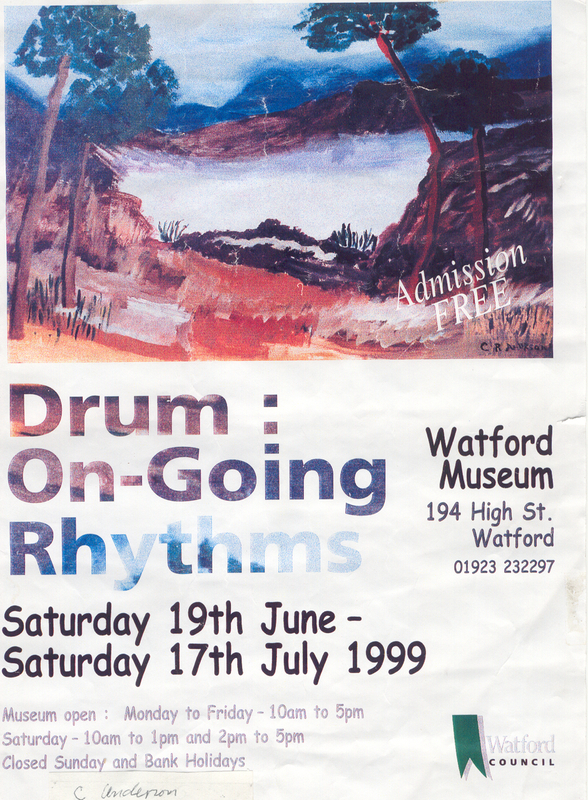 Picture painted by Charles Robert (Charlie), the son of Charles Edward and Laura Anderson, and used in advertising poster. Photo of my father, Eric Robert, born on 19 July 1909 in Wanganui, New Zealand. My father, Eric Robert Anderson, (second from bottom row, second from right) beside his sister, Mary Huia Anderson. She had insisted on sitting beside her brother rather than have her photo taken with the other girls. The boy with his eyes pricked out by Mary was disliked by her! The 7 children of my grandparents, taken in Wanganui, New Zealand in the 1920s. Left to Right: Eric Robert (1909-1967); Beryl (1912-1993); Ian Charles (1918-1986); Allan James (Bunt) (1921-1994); John (Jack) Travers (1916-1989); Mary Huia (1910-2002); Jean (1914-2009). House built for my grandparents and their family at Smithfield Road, Wanganui. Alfred and Florence lived there until their deaths. Their son, John (Jack) Travers Anderson, and his wife, Zillah May, then lived in the house until their deaths. 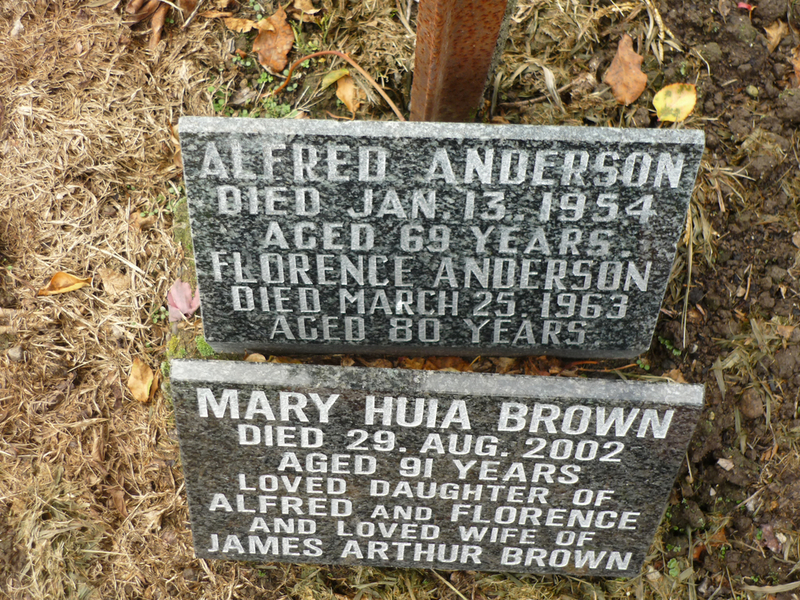 Memorials to Alfred and Florence and their eldest daughter, Mary Huia, in the rose garden for cremation ashes in Aramoho cemetery, Wanganui. Florence was actually 82 when she died. Taken on the marriage of my parents on 22 January 1938 at St. Mary's church, New Plymouth, New Zealand. Taken on the occasion of the marriage of my parents on 22 January 1938. From the left: Eric Robert, Beryl, John (Jack) Travers, Jean, Alfred, Florence, Allan James (Bunt), Ian Charles, Mary Huia. Photo provided by Stephen Watson. Home of my parents, Eric Robert and Hazel Emily Anderson, and family from 1941 to 1967/8. Photo taken in 2012. Believed to have been taken when my sister, Patricia, was bridesmaid at the wedding of my uncle, Allan James (Bunt) Anderson and Patricia Treadwell in Wanganui, New Zealand. My parents leaving a DC3 aircraft of NAC (now Air New Zealand) during a visit to Christchurch, New Zealand, in the early 1960s to attend a Rotary International conference. My father was the second president of Wanganui North Rotary Club. Memorial to my father, Eric Robert, in the rose garden for cremation ashes in Aramoho cemetery, Wanganui. Taken in January 2006 when I became Captain of Burton-on-Trent Golf Club.